This is a legtimate question… Robert Bales has been charged by the United States military with 17 counts of murder, one being for an unborn child. Nidal Hasan, the Fort Hood gunman, was not. One of the 17 murder counts that the United States military filed against Staff Sgt. 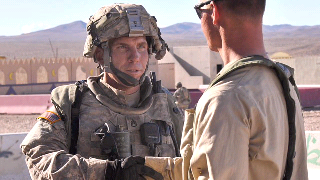 Robert Bales is for the death of the unborn baby of one of his victims, a senior Afghan police official said on Monday. Sergeant Bales was formally charged Friday with 17 counts of murder and 6 counts of assault and attempted murder. Afghan officials have said, however, that 16 villagers were killed in the March 11 massacre in a rural area of Kandahar Province. An additional murder count for an unborn baby would explain the discrepancy between American and Afghan officials over the number of dead. “The Americans are right and one of the females was pregnant, which is why they are saying 17,” said the Afghan police official, Brig. Gen. Abdul Raziq, the police chief in Kandahar Province. By contrast, Nidal Malik Hasan was only charged by the military with 13 counts of murder after his shooting rampage. A pregnant soldier shot during a rampage at a Texas Army post last year cried out, “My baby! My baby!” as others crawled under desks, dodged bullets that pierced walls and rushed to help their bleeding comrades, a military court heard Monday. A soldier had just told Spc. Jonathan Sims that she was expecting a baby and was preparing to go home, when the first volley of gunfire rang out Nov. 5 in a Fort Hood building where soldiers get medical tests before and after deploying. “The female soldier that was sitting next to me was in the fetal position. She was screaming: ‘My baby! My baby!’” Sims said. Pvt. Francheska Velez, a 21-year-old from Chicago, had become pregnant while serving in Iraq. She was among the 13 killed in the worst mass shooting on an American military base. Should have been 14. Not 13. A 14th charge of murder could have been levied against Hasan based on the Unborn Victims of Violence Act and Article 919a of the Uniform Code of Military Justice. This is the same code cited in the New York Times article on Robert Bales. Charging Sergeant Bales with the death of a fetus would explain the discrepancy and under a seldom-used section of the Uniform Code of Military Justice, the death of an unborn baby could be considered murder whether or not the killer was aware that a victim was pregnant and whether or not he had intended to kill the fetus. Why was the seldom used section of the code invoked for Sergeant Bales, and not Major Hasan?